On a rural stretch of State Route 45 in a lonely grove surrounded by fields, stand a small chapel and a large cross reminiscent of shrines built in Europe long ago to provide solace to pilgrims, shepherds and outcasts in the wilderness. I can't think of another place like this in California. A plethora of plaques enlightens the visitor. 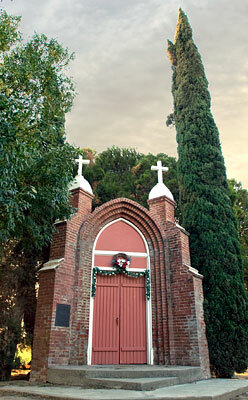 Site of the first Catholic mass to be said in Colusa County, May 1856. 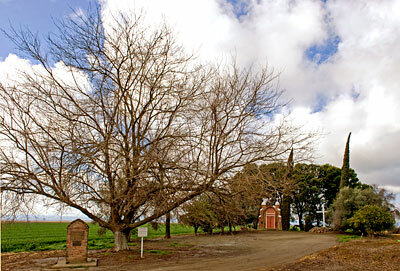 In 1864, a Catholic mission was conducted and a large wooden cross erected to commemorate the occasion. Masses, pilgrimages and visits were made here continuously thereafter. In order to preserve the identity of the place, Father Michael Wallrath secured a deed from Mrs. Anna Myers to this parcel of land and constructed a small shrine from hand kilned bricks in 1883. Welcome to the Site of Our Lady of Sorrows. 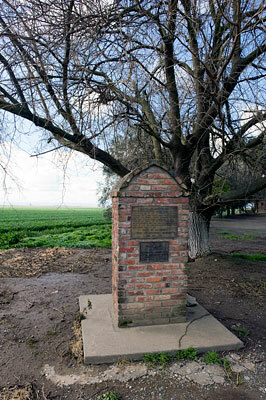 Site of the first Eucharist celebrated in Colusa County in May, 1856, Rev. Peter Magagnotto, C. P., presiding. 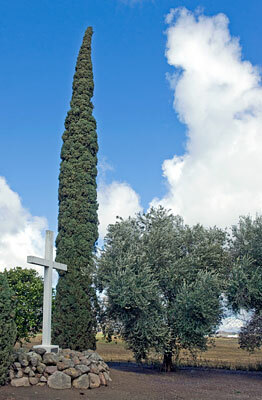 The present cross, erected by the Knights of Columbus, replaces the one first erected here in 1864. The shrine itself was built by Rev. Michael Wallrath, the first pastor of Our Lady of Lourdes Parish. The Eucharist is celebrated here on the last Sunday of April and on Thanksgiving Day (weather permitting). You are welcome to pray here. Any other activity is allowed only by permission of Our Lady of Lourdes Parish, Colusa.